Roam around the waters of the crystal-clear lagoon surrounding Veligandu, and discover what secrets lie hidden just beneath the surface. Contemplate schools of colourful fish playing ‘hide and seek’ amid colonies of marvellous coral and enjoy close encounters with other curious, yet friendly marine species. Eager to snorkel beyond the island’s house reef? Here’s an idea! Catch a ride on one of our specialised snorkelling trips and take the chance to explore a plethora of other wondrous sites nearby. 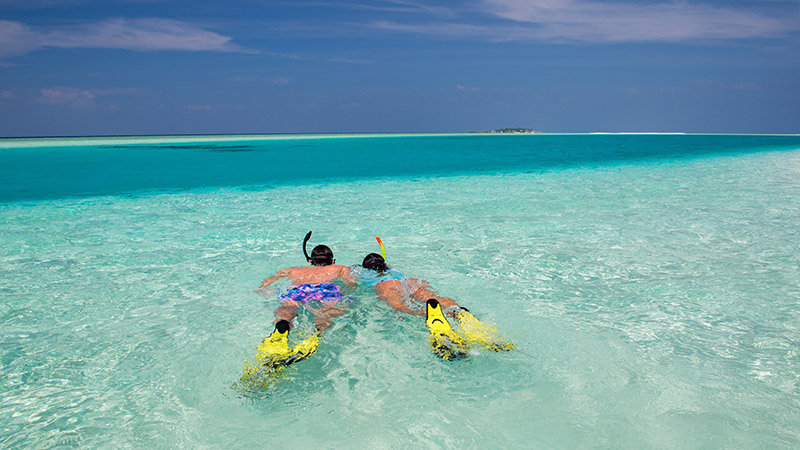 Veligandu offers world-class snorkelling experiences in the Maldives. Explore the nearby coral reefs of Madivaru, Rasdhoo and Kuramathi Islands. Explore less frequented coral reefs off the coast of Veligandu. Book a private speedboat trip and snorkel amid the coral reefs of Madivaru Corner, Manta GAA, Rasdhoo or Veligandu North. The early bird gets to experience an exhilarating, yet serene snorkelling adventure amid the nearby coral reefs at dusk.